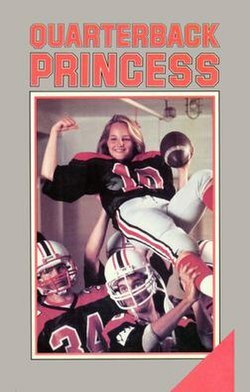 Quarterback Princess is a 1983 American made-for-television fact-based sports drama film by 20th Century Fox that chronicles the courage and determination of a teenage girl who struggles against sexism and fights to play on her high school football team. It was filmed primarily in McMinnville, Oregon. Because of legal issues, various signs were modified to say "Minnville." Tami Maida wants to play quarterback for the high school football team. However, because she is a girl, everyone from the coach to her next door neighbor is against her. Tami goes out to prove that not only can she play football but she can win the state championship. Not only does Tami succeed, she also becomes the homecoming princess.